It's time for another fabulous Wacky Watercooler Blog Hop. This month we are focusing on Christmas. It's just a wee bit over a month away and, if you are like me, you have plenty of gifts and cards to design and make for family and friends. I have no doubt that you will find plenty of inspiration from those of us sharing our Christmas projects with you. So, grab a cup of your favorite beverage of choice, sit back and see what's in store. Enjoy! Tonight I'll be joining a group of local Stampin' Up! Demonstrators for our annual Christmas dinner and gift exchange. This year I decided to make a matching desk ensemble. 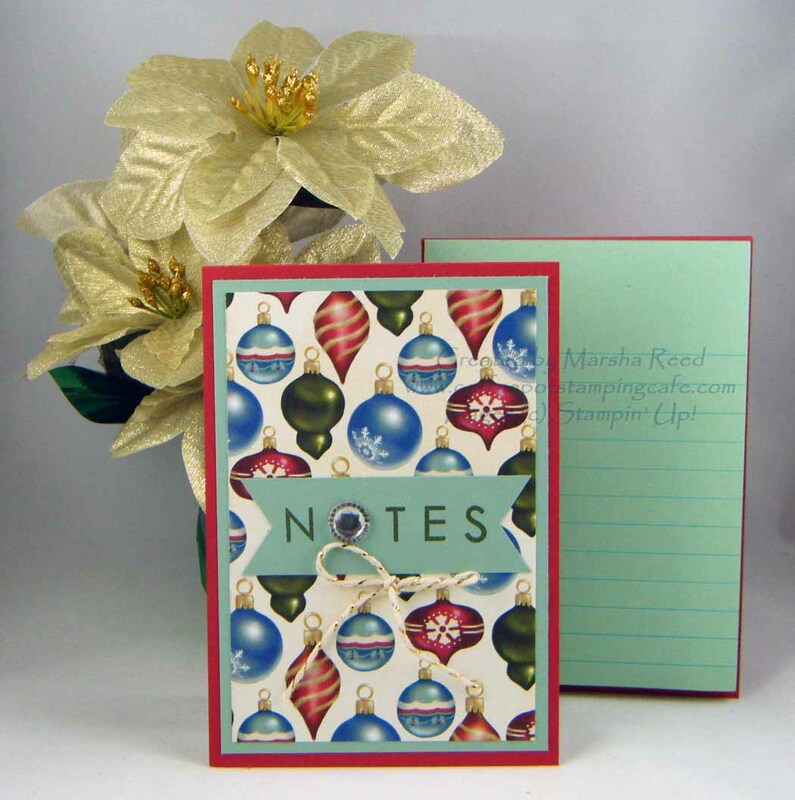 This mini note pad, in it's festive holder, will fit nicely on anyone's desk. My second project is the other half of the desk ensemble. As you can see, it's a calendar and sticky note holder. 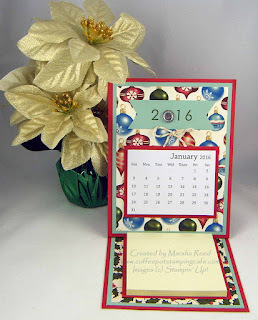 The easel card is so much fun to make and it is so easy. I'm planning to make this set for the three people who work in the office here where I live. I always give them a little something I've made every Christmas. My final project, also 3-D, is a little tealight that sits on the Wondrous Wreath. I'm sure I saw this somewhere and it stuck in my mind to try it. Although, I don't recall who specifically came up with this, I do thank them. I saw several in my snooping on the Internet. I think I just might add a name to it and use them as place cards on my Christmas table. Next up is Christine Giuda. To see her wonderful projects, click the image below. Great projects. Love that DSP. Tealights...great idea. Thanks, Christine! 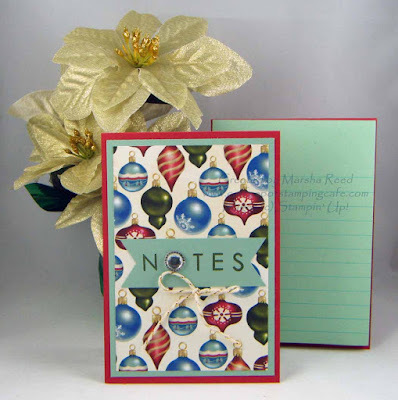 Home for Christmas has been my favorite DSP from the Holiday Catalog. What a wonderful gift of the desk set! (I see we both like post it note holders!). The little tea light wreaths are too cute - are they attached to the wreath? Thanks, Deb. I'm planning to make desk sets for my friends and family. I'm thinking of adding ribbon to the tealight wreath and turning it into an ornament. Your mini note card holder and calendar are so cute! What great gifts!! Love the wreath tea light too. Thanks, Marie! The thing I like most about them, is they are all so easy to make. Wow!! I love your desk ensemble; what a great gift! And the tea light/wreath is adorable. Thanks, Buffy! I'm hoping all those who receive a set will think so, too. Hi Marsha, thanks for having been such an active part of this wonderful blog hop all year. I hope you'll have a wonderful Christmas. What a lovely way to have a get-together with like-minds. I love that you have a dinner and gift exchange with fellow demos. Your gifts are not just gorgeous but thoughtful as well. I especially love those post-it note easel cards with the calendar. If I can find small calendars around here then I definitely want to make several. The tea light which you've made using the wreath bundle is such a cute idea, especially as place card/favours. Love it! Thanks, Heidi! I have gotten a lot of nice gifts from those demos over the years. We get together every other month to swap, share ideas and discuss business.